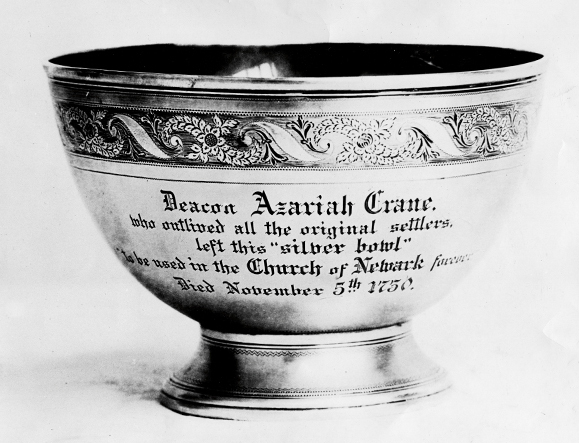 Deacon Azariah Crane, who died in 1730, left this silver bowl to be used in Old First Church. Old First, known as 'the church that founded Newark,' was established 46 years after the landing of the Mayflower, following the Great Fire of London, and shortly after the close of England's Elizabethan Age. In fact, the congregation which came to Newark in 1666, was actually formed in 1644 while still in Connecticut and arrived here in its 22nd year. Abraham Pierson, the church's first minister, was born in Newark-on-Trent, England. Newark's original name, New Milford, was changed in 1668 to honor his British birthplace. The building that we know today as Old First is actually the third structure to be occupied by the congregation.The first was a modest building that doubled as meeting house and church and was on the west side of Broad near Market Street.The second church, built of stone and accommodating up to 400 people, was located diagonally across from the present site, and was in use from 1715 until 1791. Even before the Revolution, it was felt that a larger and more splendid building was needed. As a result, the present building opened on New Year's Day in 1791. Three-hundred and 30 years of Newark history is closely associated with Old First. Two-hundred and 50 years ago the Rev. Aaron Burr, Sr., the seventh pastor, located the College of New Jersey in the church parsonage before it left Newark for Princeton. In 1718, Old First founded the First Presbyterian Church outside Newark with the emergence of the Mountain Society which became the First Presbyterian Church of Orange. In 1733, the political power of Old First diminished because of the incident over Col. Josiah Ogden 'whose insistence on having his rain-threatened wheat crop (harvested) on the Sabbath, led to him being rebuked by church leaders, a dispute within the congregation, and the establishment of Trinity Church.' In 1744, David Brainerd was appointed 'missionary to the Aborigines,' and in 1753 the church was granted its charter by King George II. A copy of the original document is displayed in the church today. By 1755 there was a movement to construct a new church building. Eleven thousand pounds was raised and plans were discussed for a new house of worship. But as war neared, legend holds that the fine architectural interior wainscoting made for the building was hidden for safekeeping in the Newark meadows east of Elm Street. Alexander MacWhorter, minister of Old First and a staunch supporter of the Revolution, fled Newark prior to the arrival of British troops under Lord Cornwallis to join his friend General Washington as they marched south to the eventual crossing of the Delaware. When the present church was completed 205 years ago, it was the finest church in all of northern New Jersey. Constructed of local building stone, its tower was the tallest in town, and recognizable all over the village. A double row of clear glass windows illuminated the finely handcarved ionic interior, and the following Latin inscription, translated in 1922 by Dr. Julia Sabine, appeared over the front door: The inhabitants of Newark constructed this splendid building dedicated to Divine worship, in a religious spirit and through remarkable munificence (it was done) under the pastoral care of the Rev. Alexander MacWhorter, DST (Doctor of Theology), who placed the first stone, in the year of salvation 1787; year of the United States of America, 12. With God being favorable, it shall remain for a long period.